It’s no secret that I LOVE Vitacost! I’ve been ordering from them every month for years. It’s a mutual relationship. They offer me the best deals on my favorite beauty, food, and home products, with new specials weekly on top of their already low prices, and I eat them up (literally). Whenever I hear of a new product to try whether it’s a recipe ingredient or health store product, I always search their site first and I almost always find it. It’s the only site I trust to buy supplements from because when you order from a site like Amazon, you don’t always know if you’re getting the real thing. 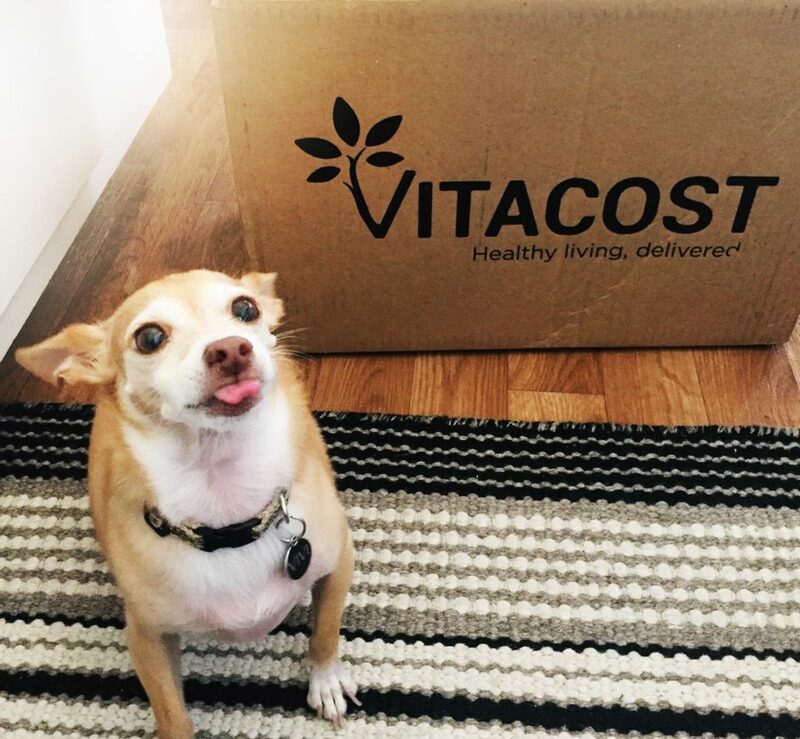 Since Vitacost is turning 25 this year they asked me to share some of the items that I order from them every month and in turn, they will offer YOU a chance to win a $75 shopping spree on their site. I will choose one winner to give a code for $75 off on Vitacost.com. Trust me you can get so many goods for $75! Maybe you’ll even like some of the ones below because they are tried and true by yours truly. It was hard to choose only 25 since I’m always finding new things I love, I’ll keep sharing my new favorites as I find them, for now enjoy my current top picks! 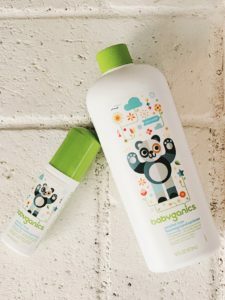 You may find a cruelty-free and chemical-free theme since I’ve been either pregnant or breastfeeding for over a year now and I love using the purest organic products possible. I will be drawing a winner on March 11, 2019, check my Instagram for details and don’t forget to subscribe to my blog. This is a great line of cleaning products for a household with a baby because it’s safe from any irritants, toxins, and fragrances yet effective for the whole family. I keep this stocked up for cleaning bottles, pacifiers. toys and dishes. I also use their laundry soap and disinfectant wipes. Safe and effective cleaner I can spray on anything and don’t have to worry about chemicals. An added bonus is that it smells super fresh! I even like the earth-friendly parsley room spray it smells light and clean and not perfume-y. This scent makes me really happy. I first smelled it burning in the powder room of a cute little brunch spot in Highland Park. It was a spring day and I knew I wanted my bathroom to smell like this. I also love the hand soap. It’s always fun to find a new lip balm, right? A friend told me that this was by far her favorite lip balm, so I had to try it. Of course, Vitacost had it and I love it too. It goes on weightless without build-up yet it’s super silky and hydrating. This is the perfect balm to use under lip liner and lipstick. This is my favorite clean mascara that actually gives a beautiful volume to my lashes without irritating my eyes. I also use the concealer for under my eyes. It’s super creamy and hides my tired shadows. I love wearing liquid liner but most of them make my eyes water…not Zuzu’s! It gives a precise line without irritation and doesn’t smear. I also like how easy it washes off at the end of the day. I use the brown for everyday casual and the black for a classic cat eye. Okay, I’m about to gush over a floss. Have you ever looked forward to flossing your teeth? Neither did I before I started using this. There is something about the texture of the strand that clings to each tooth as it glides in and cleans between impeccably. Super satisfying and a cleaner mouth to boot. This is all the stretch mark prevention I used during pregnancy and I lucked out without any! I mixed this with my body lotion and it perfectly hydrated every inch of my body. It is the purest you can get which was super important to me and it actually works. I love how it says on the label “For that special time, before, during and after pregnancy,” basically, you can add it to your regimen anytime, pregnant or not for soft skin. I’ve been using this stuff since the beginning with my babe and his skin is so soft. I like the ingredients and that its simple to use on his body and hair (he was born with a good mop). It doesn’t hurt his eyes if a little gets in and has the softest most delicate scent which makes me want to eat my child. Hands down the best hand sanitizer! No strong chemicals or fragrances yet it kills 99.9% of germs on contact and its moisturizing formula is gentle enough for babies. I get the small travel size and then refill them with the larger eco-refill bottle. I know this is super healthy and full of protein and greens but I actually just like the taste. I like to mix extra peanut butter and cacao with my banana berry and spinach smoothies. Yum. I like all their products. One of the best gluten-free pancake mixes I’ve found and I like to have this on-hand. I always will add a half of a banana per serving to the batter and it really makes these delish. It doesn’t say to on the instructions so don’t forget. When you want a simple one ingredient protein to add to a smoothie that won’t change the flavor too much but is rich in plant nutrients, I go for this. The price is amazing too. Melt 3 tbs coconut oil in a pan over medium-medium high heat in a tall pot. Remove from the pot from the burner (while leaving the burner on) for 30 seconds while swirling the pot to make sure all the kernels are evenly covered and reach the same temperature. After 30 seconds, put the pot back on the burner and move the pot back and forth over burner periodically while the corn pops. Once you hear a break in the pops, for a few seconds, remove from stove and pour into a big bowl. Top with salt and nutritional yeast. If you are obsessed with nutritional yeast like I am, get the bigger tub and put it on everything. If you’ve never tried nutritional yeast, don’t let the weird name fool you, it’s umami flavor is addicting. Put it on everything you’d put parmesan cheese on and skip the dairy and gain all those B vitamins. Vegan chocolate chips that taste delicious and can be used for a ton of recipes. I like to add these to cookies, loaves and melt down for toppings. They also have a dark organic chunk for those bigger chocolate piece needs. I love that this is a totally raw and vegan prenatal made from whole foods that do the job of giving you all the vital nutrients for before, during and after pregnancy. It’s super easy to take capsules didn’t make me as nauseous as other ones I’ve tried. I also liked these for nursing. Super fun and easy spray of organic vitamin B12 when you need an extra boost. My favorite way to take vitamin C is from a whole food source powder. This one is full of wild-gathered camu camu from the Amazon with organic acerola and an array of antioxidant-rich organic berries and sprouts. I feel an energy boost immediately after taking this and always have this in my cabinet. It’s great to take during the winter months to prevent viruses or anytime you feel one coming on. It’s also great for the skin. Most of us are magnesium deficient and I find this to be a relaxing way to ensure I’m getting enough. If my muscles are sore or I’m having a hard time unwinding at the end of the day I will take this before bed and it usually helps me sleep. I was looking for a really pure and organic daily cleanser and moisturizer during pregnancy and I found this to be one of the best I’ve tried. It has very simple and natural ingredients that didn’t irritate my skin. In fact, I don’t think my skin has looked has looked better than when I use this combo. Giant tub of organic coconut oil at an amazing deal! I use this for cooking, delicious vegan treats and to moisturize my babies skin. OMG. This. I love when a chocolate bar tastes authentic, like real dark, rich cacao, and creamy hazelnuts. Not overly sweet but really satisfying and because of the pure ingredients I don’t mind if I finish the bar. I saved the best for last because these are the main reason I continuously order every month. The Vitacost label: nuts, seeds, beans, superfoods, oils, spices, chocolate chips etc. They have the best deal on organics with no membership. And they often times do buy one get one half off deals. Stock up on the goods! Happy 25th Birthday Vitacost!! Here’s to another 25 years and more deals. Don’t forget to enter to win $75 to spend! 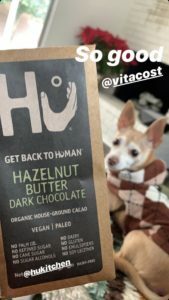 Click the picture above to get to my Instagram page and comment the item you’d most want to try to enter to win $75 on Vitacost.com! I was inspired to make a healthy version of Cherry Garcia Nicecream because I think it’s an excellent treat to eat before you sleep! There are so many healthy sleep promoting ingredients that will curb your sweet tooth too! Eating healthy carbs before bed (like bananas) are the perfect snack because they are full of brain relaxing tryptophan.  Bananas also help balance your serotonin levels and help with melatonin putting you in a good mood and helping you sleep. They also are full of magnesium and potassium which will help relax your muscles.  Cherries are a natural source of melatonin which help to regulate your internal clock.  Cacao is full of antioxidants that help you get your beauty sleep as well as mood elevating properties. It’s also full of muscle relaxing magnesium! Try this next time you’re craving a sweet treat before bed!  The full Printable recipe is under the video!! 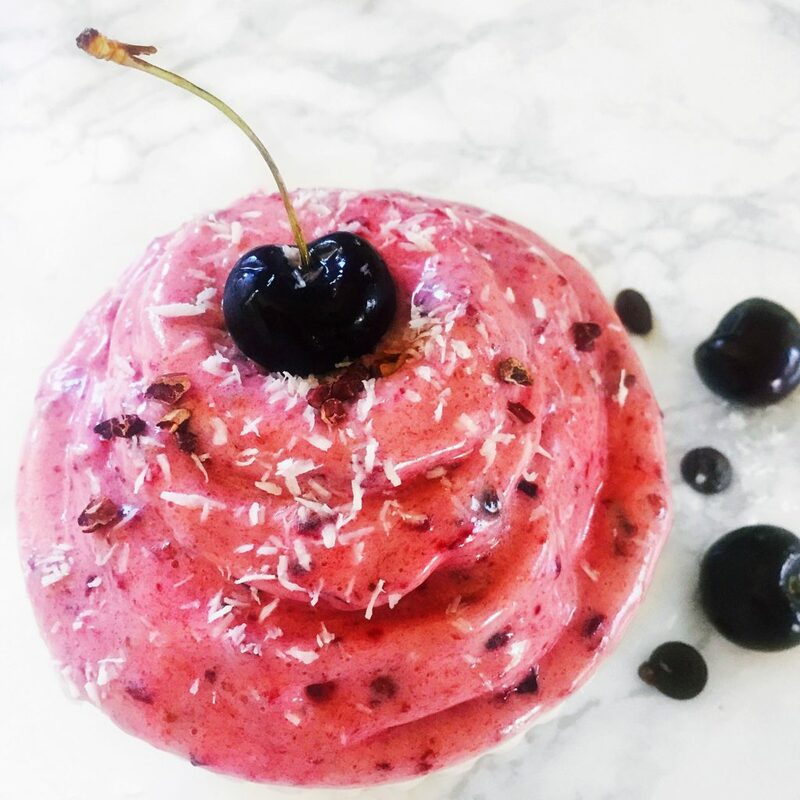 🍒 Healthy “Cherry Garcia” NiceCream that will actually help you sleep! 🍒 Eating healthy carbs before bed (like bananas) are the perfect snack because they are full of brain relaxing tryptophan. 🍌 Bananas also help balance your serotonin levels and help with melatonin putting you in a good mood and helping you sleep. They also are full of magnesium and potassium which will help relax your muscles. 🍒 Cherries are a natural source of melatonin which help to regulate your internal clock. 🍫 Cacao is full of antioxidants that help you get your beauty sleep as well as mood elevating properties. It’s also full of muscle relaxing magnesium! Slice frozen bananas and set aside to soften while you gather the rest of the ingredients. Slice and pit 1/2 cup of cherries. In your food processor, blend bananas until they become a (ice) ceamy base. Add the rest of the ingredients to desired consistency leaving some pieces more chunky. Place in a bowl and enjoy! Scroll down to the bottom and I’ll have links to some of the stuff in the video! I’m loving this Amazing Grass Belly Elixir in my smoothie! Love this whole food Vitamin C! Why am I SO OBSESSED with BBQ chips lately?? Absolutely LOVE this company and this Seabuckthorn Matcha Tea full of antioxidants, anti-inflammatories, gut healers, vitamins, minerals, protein and skin boosting goodness!! The absolute BEST marinara sauce ever! I make so many meals with this one jar of Rao’s Homemade Marinara, all good ingredients! More info on the natural ionic calcium Alkaline Alka Water I mentioned in this video! I remember growing up always having the latest product line from Bath & Body Works, I mean, the entire line, everything from the scrub to the thick body cream in a jar. I would go through the routine steps of getting the ultimate clean, soft and glowing skin from head to toe and smell amazing on top of it! This has become a process that I actually enjoy, it’s part of my beauty regime that makes me feel my best. Over the years, I started to become much more conscious of not only what I put into my body, but also what I put onto it. Getting into this lifestyle of being as healthy and happy as I could be definitely caused me to reevaluate many products in my beauty arsenal. 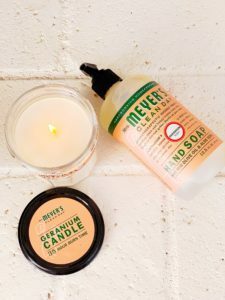 I wanted to move away from all chemicals and move towards organic, vegan and cruelty-free products that also still made me feel really good and smell good too! Many of you have asked what products that I currently use so I decided to put together the ultimate beauty guide of some of my top favorites! As much as I am all about organic products with the least amount of junk in them, I am by no means perfect and we do have to choose our battles. For instance, I still get my nails done and is that the healthiest thing to do? Maybe not, but it really makes me feel good. (Also, I use SNS System which is definitely a much more natural alternative to gel nails). I also still really like to smell great and that is something I’m not willing to compromise on at this time. While most chemically fragranced products really do bother me, I find the more natural stuff tolerable for me, for now…so if it’s natural and smells soft and good in the scents I like, then it’s a win-win. I’m also still picky as heck so if it’s on this list I truly do like it….while not all of these products may work for you, I encourage you to start to read labels and become more conscious of what you put on the largest organ of your body because it truly does matter! Also, taking the time to truly care for yourself with quality products is essential for overall well-being and health. I did a little video a while back where I talked about some more of my thoughts on showering and shampooing and you can see that here. Most of these products are also super affordable and attainable, I’ve linked all the pictures and you will notice I get most of my beauty product from Vitacost! You may be asking, “Dandruff shampoo? You don’t have dandruff! !” Exactly!! Did you know that in most cases dandruff is not curable, some people are pre-disposed to it, but it is certainly something that you can manage which means you never have to see it! It starts with a clean scalp and a shampoo that helps slough away scalp debris. I have tried many natural dandruff shampoos and this is by far my favorite because it actually makes my hair look soft and pretty while keeping my scalp clean. I have been using this for several months and even if I try something new, I still go back to it because I love how it makes my hair look. I also have a video where I talk all about shampooing and how often you should do it and you can see that here. A few years ago I bleached out the bottom strands of my hair and rocked that ombre look for a few months before going back to my natural color. Even now, I have some warm highlights that never look fried because this conditioner works so well. I also have an amazing stylist that keeps my ends trimmed, but still, this always keeps my hair looking shiny and healthy and smells SO delish too! Speaking of coloring my hair and my hair stylist…during my treatment she recommended this product to protect my hair from heat, seal in color and keep it super shiny without weighing it down. This product is a life saver (or a hair saver) it really works and can make damaged hair look new again. I use it every time I wash my hair after I towel dry before styling (it protects hair from heat) and sometimes will use a touch to finish the look for a sleek, frizz-free finishing gloss. It also just so happens to be vegan, cruelty-free and made with organic ingredients! Major game-changer alert! Okay, this may be the fancier and pricier product on the list, but trust, it’s worth it. I know, it’s even aerosol, just don’t breathe it in because a few spritz of this in lifeless hair literally transforms it into the goddess main you’ve always dreamed of. You may start asking, “Where did all this hair come from?” You may even get a little cocky and forget how limp your hair really is (until you wash it). It also absorbs oil and acts as a combo dry-shampoo and texture spray perfect for volumizing curls or creating beachy waves. It smells divine and although may not be 100% organic, it’s formulated without parabens, sulfates or sodium chloride and is vegan, cruelty-free and gluten-free! I still love a yummy smelling body wash! Especially when I use my exfoliating body mitt and build up a nice lather before shaving my legs. It really makes for the best shave and smoothest skin. This Rosewater scent is my favorite one by Jason, as you know, I love a good rose scent…this one is really soft and lovely with a nice clean note. I love getting the large one with the pump for convenience as well as using it to refill my hand soap dispenser. 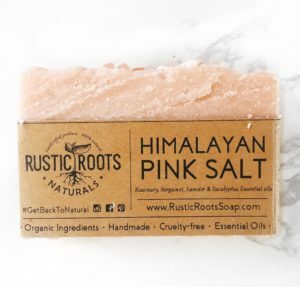 How nice is it to have an all natural hand-crafted bar of soap on hand? Especially when it’s a super unique Himalayan Pink Salt bar. This exfoliating pink power-house is loaded with minerals like magnesium which really help soothe sore muscles after a long day. I love how well it lathers into a creamy, sudsy foam and feels perfectly relaxing. I also love how these bars are made by a family who’ve created so many unique concoctions. Another favorite is their coffee and chocolate exfoliating bar that I love to pair with my exfoliating mitt and use as an anti-cellulite treatment. Alright, on to some of my favorite fun topics/products (am I weird) and that is BODY LOTION. I don’t go a day without it…I’m always slathering it on my skin fresh from the shower and often also add a body oil to it for even more moisture (and sometimes fragrance). I love really soft moistened skin and if I don’t use a good body lotion, I feel it, and it doesn’t feel good! I really wanted to find a good body lotion with the least amount of chemicals since I really like to use one every day and can’t just use an oil alone. I don’t know, there is something about the feel of lotion on my skin that I just can’t get with a body oil alone. Incidentally, I often have to add an oil to my body lotion to get that perfect balance. But I really think I’ve found it, folks!!! This Desert Essence organic body cream is SUPER Hydrating and practically perfect on its own. It soaks right into the skin never feeling greasy. It is fragrance-free and has ingredients I feel good about. You can even add a drop of Lavender essential oil for a nighttime sensory experience! (More on Lavender later on). This is the healthier version of a luxury scented body butter y’all! Yes, this cream is luscious and it comes in my fav scent, as well as many others! When I’m feeling saucy, or every day, I smother this lotion all over followed by the same brand rose fragrance and I am set! It smells, clean, soft, elegance, feminine and seductive, I love this! Rather, this Tahitian body oil will be for sure! This is one of my favorite oils to mix in my body lotion because not only does the smell take you away to your favorite tropical island in 86 degree weather with the perfect breeze….it makes your skin so soft and glowing! I also like to use a little of this in my hair for an extra smooth do with a subtle hint of paradise. It’s mainly just coconut oil with real flower (they put one in the bottle), fragrance and vitamin E. There are a few different scents but this classic gardenia scent is what the Victoria’s Secret models use when shooting, I also like the Jasmine. I love how the bottle describes Rose as a symbol of love and beauty and the queen of flowers. All I know is that I do feel like the queen of flowers when I spritz this on! It’s one of the few natural fragrances that I can tolerate and actually really enjoy. They have tons of other fragrances too! With very few ingredients listed (including essential oils), I feel good about this brand. Of course, it’s also vegan and cruelty-free, yay! Major Beauty Secret Alert! 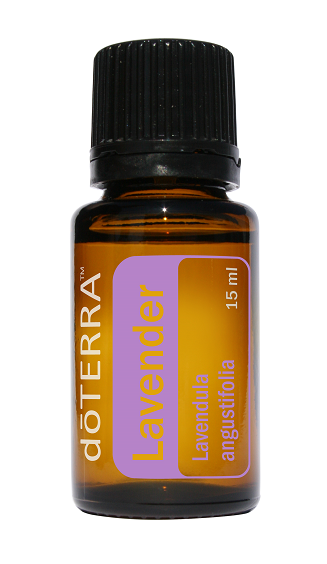 There are so many beautifying essential oils, but one of my top favorites is lavender oil. Not only do I love to mix a drop or two into my lotion during my nightly routine for a relaxing voyage into night, I also use it for many other things as well…I add a drop to my clay masks, I use it as a spot treatment for rosacea and blemishes, I use it on minor knicks and scratches because it works as a gentle disinfectant as well. It’s perfect to use on cuts you may get from the nail salon, just put a drop directly on it and it will be gone before you know it! You can also mix it with another oil and use it on your cuticles. Doterra is my top choice in essential oils because they are the most potent and pure. Not every essential oil is suitable to be ingested, but with Doterra you can trust the quality. If you want to get your hands on one or have any questions send me a direct message and I will help you out, you can also order here. This is my dream deodorant! I had been hearing about it for a while before I tried it and am so glad that I did! I’ve been using all natural deodorants for years and usually use the Crystal roll-on, which I also like…What I love about this one though, is that it smells so delicious and really works, plus it doesn’t irritate my skin. Many other deodorants have caused itchy bumps and in-grown hairs but this one leaves my skin smooth, soft and smelling fresh. I wanted to include this on my list because I find so many uses for this it’s beauty essential indeed! First off, I use this as a facial cleanser as it was recommended by my facialist a while back, as long as it is the baby formula it is a super gentle, natural cleanser for the skin. (I’ll get more into my face beauty essential in another post). I also use it as a hand/body soap, to clean my makeup brushes (it really works to get rid of all the makeup) and I also find it to be the best cleaner to mop my floors! They even have these in a travel size which is the perfect all-in-one travel essential! Ahhhh there’s nothing like a Rosewater spritz after you wash your face…or after you do your makeup…or to refresh your makeup…or to cool off…or to revitalize your locks…or anytime really…you get the idea. Rosewater soothes the skin, refreshes and tones. You can even use it in your lemonade, get creative…it’s wonderful and smells amazing. 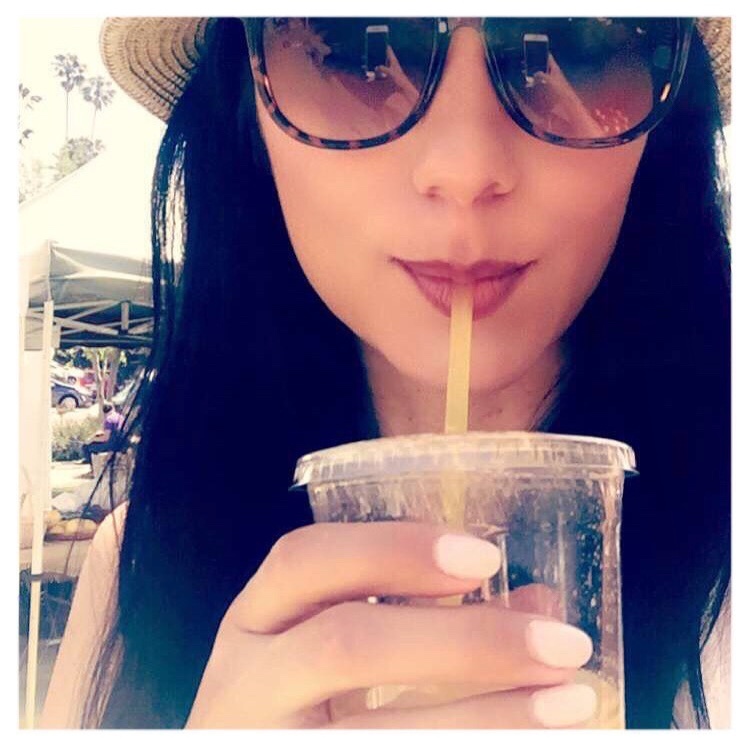 I hope you liked this FIRST installment of my absolute favorite beauty essentials. If you did, please let me know in a comment below. I’d also love to hear what your favorites are. Let me know if you have any requests below too, I will be doing a skincare and makeup post coming up soon as well, so be sure and put your email in the box above so that you don’t miss a post! P.S. I’m always testing and trying new products but only share with you what I actually use and would also recommend to my mom or bff! Come along as I explore Eat Drink Vegan’s Beer and Food Festival 2017! It was my first time attending and I ran into so many other vegan YouTubers and bloggers! This is a super quick video I put together to share a glimpse into what it’s like at the Rosebowl event, even though there was SO much I left out and so many other people that I didn’t include…I’ve got to work on balancing enjoying the event and filming at the same time…haha! Let me know if you were there, maybe I got you in here without knowing it (that happened a few times)!! Special thanks to the Cafe Gratitude crew and especially Ryland Engelhart! On the other hand, you might become frustrated by what seems to be the LACK of plant-based food choices…you may wonder “what’s the best vegan cheese alternative” or “what kind of bread do I buy!” It can make you just want to forget the whole thing altogether…I GET IT!! It honestly doesn’t have to be so confusing!! Here are 5 foolproof resources that will help you to easily and inexpensively make the healthy plant-based choices for you and your family and these just so happen to be fun too! If you’ve followed me for a while you will have seen me talk about this mega-resource because I have been ordering from them every month for YEARS. I find them to have the most discounted food and supplement products out there. Not only are they super easy to order from and have specials constantly on the already discounted products, they also deliver to your door within 2 days and the selection is better than your local Whole Foods. Oh, and if food and supplements weren’t enough they have a lot of drugstore options too like eco dental floss, dish soap, pet foods and even Himalayan salt lamps! So next time you come across a recipe ingredient that has you scratching your head, type the product into the Vitacost search box and the next thing you know, it will be on your doorstep without breaking your bank account, seriously. Okay, this might me the most fun one on the list because you can really make a day of it or start a weekly ritual with a friend and you will learn SO much about local and seasonal food every time you visit. If you haven’t ever gone YOU MUST. Sometimes when we are on our Farmer’s Market kicks and online shopping we forget just how doggone low Trader Joe’s prices are especially on greens, potatoes, produce, frozen fruits, veggies, tea, flowers and they just started selling super cheap nutritional yeast! Compare prices!!! 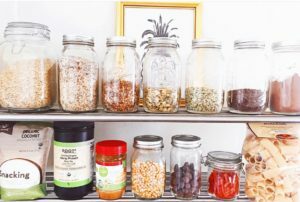 Pick out which things you always buy at trader Joe’s so you can run in and grab those few inexpensive items and get on out! Eating simple whole fruits and veggies is the most important thing to keep in mind. Make sure you are smashing in the healthy carbs: bananas, potatoes, quinoa, rice, veggies, dates, etc and filling up…The main thing you want to keep in mind is making sure you are food combining properly and just eat simply. A quick rule on food combining is to eat the bulk of your fruit in the am before any cooked foods and never after and try eating greens at every meal. 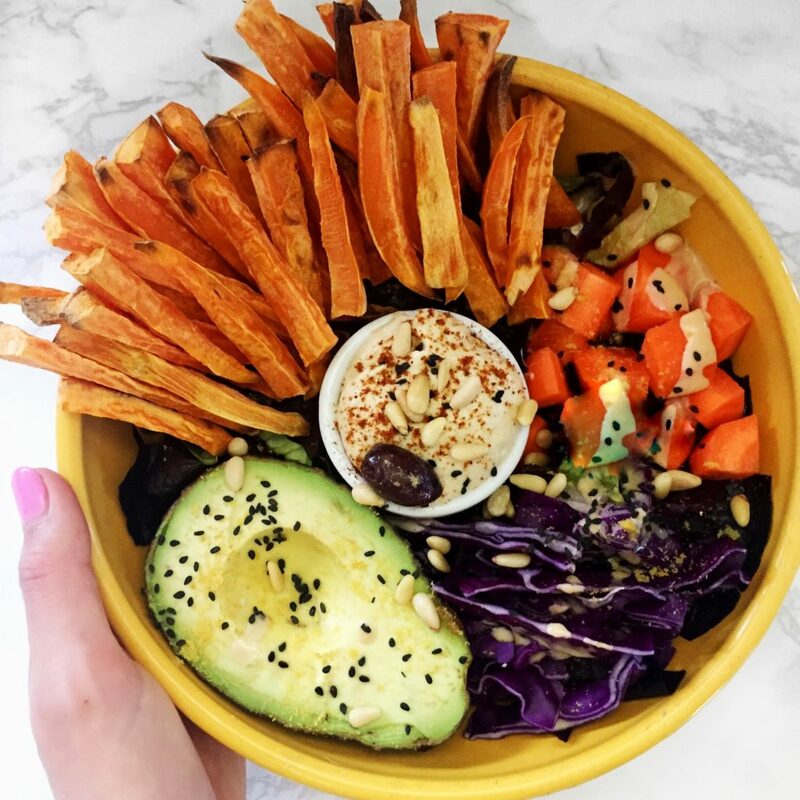 Fruit and smoothies in the am and eating a huge salad with your favorite veggies and potato wedges or sweet potato (no-oil) fries in the pm will be your best friend on this healthy lifestyle. It may sound simple and it is! 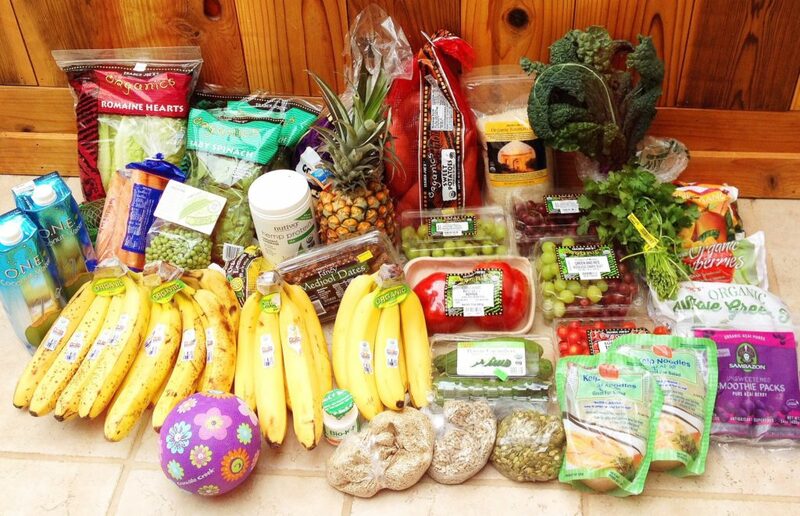 Eating simply is not expensive, picking up a bunch of bananas and a bag of potatoes is super cheap. Definitely don’t try and get too fancy with your food when you are first starting out because you will burn out quick. Keep it simple and carbed up! This might be the most important tip for switching from a SAD to a plant-based one. The reason why is because at first it may seem radical to only eat plants, right?! You kinda have to see it to believe it, see what other people are eating, rather, THRIVING on daily. There are some amazing people posting content daily, so get inspired. Most of these peeps are also alerting you of when things are on sale or offering discount codes too! You will learn SO MUCH about what is out there on this lifestyle…and I promise you will learn what vegan cheese is best!! Another great resource is NutritionFacts.org, Dr. McGregor the author of “How Not to Die” post regular YouTube videos that debunk health myths and offer great insights based on medical research that promote a healthy whole-food and plant-based diet. For more info, I have put together a SUPER DETAILED “Getting Started” Shopping list and I want you to have if for FREE. Just sign up at the top with your email and I will send it on over! Comment with your thoughts, love! Pancakes and Planners!! This Happy Planner is SO MUCH FUN!!! Pancakes and Planner  Have you seen my latest vid where I go shopping for this new #HappyPlanner?? If not, link is in my bio!! @carmyncita shows me the awesome accessories at @michaelsstores!!! Loving my new @the_happy_planner  ✔️PS. Please tag me in your favorite gluten-free vegan #Pancakes recipes!! Just got a new pan so I’m about to go pancake crazy! !